Welcome to the Golden Isles! The Golden Isles have some unique characteristics. For example, did you know that Georgia's coast is only about 110 miles (some don't even know Georgia has an ocean- front coast line! ), yet has about 1/3 of the salt marshes on the east coast? Take a look at a map of the country and you will see that we are on the most western part of the East Coast. Because of that, and the Gulf Stream running about 80 miles off shore, most of the storms from the Atlantic pass on by. We also have some great artists and craftsmen, a great college in Brunswick, the College of Coastal Georgia, several pro golfers, and some of the best high school athletes around. Great local restaurants, local shops, and an economy that thrives because of local residents, employers, and tourism. There are many barrier islands along Georgia's coast, but only 4 are accessible by car: Tybee Island,St. Simons Island, Sea Island, and Jekyll Island. Others can be reached by boat, and a few have air strips. These islands help protect the mainland from the effects of storms and everyday weather. The southern portion of the coast (Glynn County) is the farthest west area of the east coast, and the Gulf Stream runs about 80 miles off- shore, and this seems to deflect the Atlantic hurricanes that head this way from the southeast. It has bee well over 100 years since we had a direct hit in the Brunswick area. Coastal Georgia Real Estate - it’s a Great Time To Buy! Whether you want a second home, or are ready for a move, looking for condos or lots, this is a Buyers Market. Our prices are still pretty low, but the volume of sales is increasing, as Buyers recognize the value of owning Real Estate in Coastal Georgia. For Personal Service, call me or send a note. Sea Palms Coastal Realty is a full service real estate company serving St Simons and the Golden Isles, and I would love to hear from you! 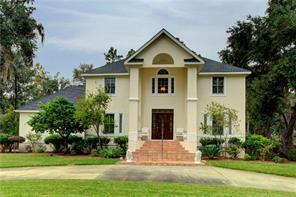 Check out the Featured Properties, or search all the listings in the Golden Isles MLS . "No Other REALTOR Will Serve You Better"